This isn’t a blog about Thanksgiving. I know the title is misleading. However, it is about the gobbling up of small business by big business. If you haven’t heard already, Robin’s Bookstore (13th and Board Street) is closing its doors. After 73 years of being Philadelphia’s oldest INDEPENDENT bookseller, the store will be gone. As the store is preparing for the end, the remaining books will be sold at a discounted price. I always hated going into those bookstores in their last days because it just feels so sad. I always felt like I was picking at their bones. I also felt like a cheapy mccheapy pants. But I just can’t stand books without homes. Also, I know that buying those remaining books helps out the seller…even if it was just a small amount. But why does this keep happening? Why are small businesses being destroyed by big businesses? Is it the Internet? I remember when I was in London and I had the best time when I visited the antique booksellers. I was able to talk with a real person and ask his opinion on things. This one older gentleman and I had a lovely discussion on how London felt about Sylvia Plath and Ted Hughes. It was completely awesome getting that personal opinion on a subject very near and dear to my heart. Also, he showed me a few rare books I wouldn’t have seen if he didn’t take the time to speak with me. A big bookstore can’t do that. The employees can’t take five minutes to talk with you. The stores are so micro managed that I feel they forget about what is really important…the love of books and talking to people. Again, I am sad that Philadelphia is loosing a great asset to the local literary community. I know that Larry Robin will still be looking for ways to help bring this community together. However, I just wish it wasn’t necessary to give up such a great place for writers and book lovers. I know…I know…I said I would never go back into the classroom again. But, it’s a recession people and well…I missed teaching. But I can’t do things the easy way. I always have to have some sort of crazy twist. I couldn’t just go back into a high school classroom. Oh no, I needed a new challenge. Boy do I have one now! I am going to be teaching 5th graders. Never in my life have I ever taught that age group. I have done some teaching in that grade level, but not the age group. In a way I am testing myself as a teacher. I thought if I could teach in Philly, I could teach anywhere. So now it is just a matter of putting that theory into practice. However, I am a bit overwhelmed. First, I used to think that the middle school and grade school teachers had it easy. Believe me, I am finding out how stupid and naïve I was to ever think that way. Content wise they do have it easy. That is the only way teaching the lower grades could be seen as easy. I am overwhelmed. Everyone keeps giving me books to read in my leisure. Seriously, what leisure do I have? Not only that but I will not give up my down time at home for school. If that means I have to stay until 8pm at school to get my work done, then that is fine. I refuse to bring work home with me. Seriously, people keep handing me all these books to read and I feel like screaming. I don’t have time to read about educational theory; I have to read young adult books. I am lucky in the fact that I did attend a course on guided reading, but I never had the chance to actually do it. But now, almost six years later, I have to do guiding reading. I also have to do writing workshops. Then I have to plan the stations in the guided reading lesson. Read the guided reading assignments, come up with objectives, use the standards, make sure Bobby isn’t killing Kevin, and also make sure Kristen isn’t eating the glue. But I am not complaining. I am just overwhelmed. It is hard to filter out what is really important right now and what things I can do over time. Is this not what writers go through? Don’t we struggle with what characters are important and what point of view we should use? How do we combat this? How does writing a whole story become manageable? Simply put, you find your immediate purpose. You prepare for that purpose and see that through until you finish. Add things on as you go. Maybe when you have one thing all set, you can start added additional materials. I think the thing that freaks me out the most is how much all the things I want to do in life are connected and I can use the same theories. It all boils down to when you are overwhelmed, you have no choice but to take it apart and look at its parts. Once they are manageable, then you can piece it back together. M.F. 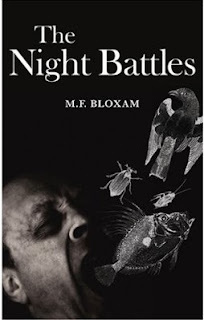 Bloxam’s debut novel, The Night Battles (Permanent Press 2008), uses a nuanced blend of history, legend, and mythology to explore the ways in which the past will always haunt the present. On the run from the wreckage of a career in academia, the novel’s protagonist, Joan Severance, escapes to Valparuta, Sicily, where she expects to put her skills as a historian to good use. The town’s archives are a treasure-trove of minutia from the lives of the long-dead, and while the records she uncovers reveal much about the lives of those who have gone before her, it’s the peculiar absences of information that lead to the biggest mysteries surrounding Valparuta. As her investigation deepens, Severance learns that the town has been the scene of an ongoing battle between the forces of good and evil for countless generations—and that this battle has taken place not on the physical plane, but on an astral one. One thing that makes this novel stand out is that while its heroine is a historian, she neither falls into the Dan Brown Da Vinci Code mold of adventurer-historian, nor is she a female Indiana Jones. That is, Bloxam doesn’t attempt to wow her readers with vaguely scandalous information about the true identity of the Mona Lisa, and she’s not especially interested in giving the world yet another action hero. Rather, Severance is more in line with James Axton, the protagonist of Don DeLillo’s The Names who, like Severance, discovers hidden, haunting meaning in the forces of history and ruminates upon that meaning in intelligent and thought-provoking ways. Emotionally stunted in many respects, Severance is not just on a quest to discover the truth about Valparuta; she’s on a quest to discover her own humanity. None of this, of course, is to say that the novel is purely a character study. Indeed, The Night Battles takes many unexpected twists and turns, and what drives it forward is both the sense of mystery that Bloxam has given to the town of Valparuta and the silent longing for some kind of emotional depth that she has given to her protagonist. In short, The Night Battles is a work of beauty, a curious cross between Umberto Ecco and Neil Gaiman—mysterious, moody, and highly engaging. It isn’t easy when you have A.D.D. and you are trying to become a writer. You want everything to happen now and that isn’t how the writing community works. I will write something and send it away. Three months later I get an email saying “no thanks.” Or the opposite happens and that is what I want to talk about today. I have noticed that a lot of my writing career happens when I am sleeping. My stuff gets published and I don’t even know it. I’ll send book reviews out and then a few months later, I’ll get an email and there is my review waving “hi” to me. I wrote a blog about the speed dating part of “Push to Publish” event a few weeks ago and I just saw that the blog is now up on the web. I am not complaining about this at all. I am thrilled to see when something I write gets “picked up.” It just creeps me out because it’s happening and I don’t even know it. I’ll write something and then I want it immediately published and read. I know I am not alone in this because people are impatient. But, if you want to be a writer, this is just another thing you have to accept about the community. Being a writer means waiting. It takes a long time for writers to hear the fate of their work. Then, when you finally get that acceptance letter, it will take some more time to actually see your work in print. It takes time for the editors to read your work and make a decision on it. Most magazines have many readers who will look over your work; it is hardly ever just one person making the choice. So, once your readers make a decision on your work your work could go two ways. Either your story goes to the next round or you get a rejection letter. If it goes to the next round, that means even more people are reading your work and more people have to agree if your work is up to the standards of the magazine. It is at that point that your work gets the final thumbs up or down. Then it is off to get published. Rewrites and editing await your piece and that causes your piece to take longer to get published. So, it could take months for a writer to hear about his or her work. While it isn’t easy for a writer to have to wait for an answer, at least understanding the process your piece goes through can help ease your mind a little. Also, if you know what happens to your piece, you can help the editors out a bit. Make sure you are not wasting the editors’ time sending them something they wouldn’t publish anyhow. Look over your work and make sure it is clear of spelling and grammar mistakes. Lastly, send something out and just forget about it. Always keep a few stories out in circulation and make sure you are always working on some new piece. This will keep your mind active and it will be easier to keep your mind off of the inbox. So, I sent one piece to that magazine I found on line the other day. You know, the one I was discussing in my last blog? At this point, I feel numb about it. That probably isn’t the feeling I should have, but what can you do? I picked the short story I read at the open mic night. I took some pieces out of it and added a few words here and there for clarity’s sake. I was afraid if I kept looking at it, it was going to go one of two ways. The piece was going to go so far off the path that it was intended to be on or it was going to go in the trash. So, I just took a deep breath and sent it along with a small, quick, and to the point cover letter. I would love to tell you all that I am sure it is going to get published, but I don’t have that feeling. Again, I am just numb about the story and I think it is because I worked it over so much. Here it is that question again, how do we know when a story is done? I still think the story is done when you have nothing left to say and your story is the story you wanted to tell. But I would like to add that maybe you know when it is done when you can’t feel anything for the story anymore. Maybe having that numb feeling is what helps us all send our work out and get rejected. If we become desensitized to the story, it won’t hurt so much when we get that form letter back. It’s not a bad story. I do like it and I love the ending. In a way, I wish my story would come true. It would be so comforting if I could look again into those brown eyes with the gold flecks and just hear you silently say that everything is okay. I bet the ending will be the part of the story that they hate. I should have taken it out. Oh well, there is always another magazine and there will always be other rejections. As writers, we just have to have just enough strength to not let one rejection destroy us and we have to stay just a bit optimistic.